Christmas is the best time to go all-glam and glittery, both in terms of clothing and makeup style. Not in vain is shining clothing considered the best outfit for the holiday season, and accordingly it requires a glam-glitzy makeup look for the ultimately memorable appearance! Today we suggest balancing things out a little, incorporating subtle shining vibes into pastel tones and finishing the look with a vibrant color touch. Have a nosey at this glam Christmas cut crease eye makeup tutorial and copycat the style to look fabulously divine, sophisticated and classy at the same time! Step 1: Prep your face for the makeup. Apply the makeup primer, the foundation and use the concealer on the areas, where you have something to hide. Apply your favorite blush tone and sculpt your face with bronzer. 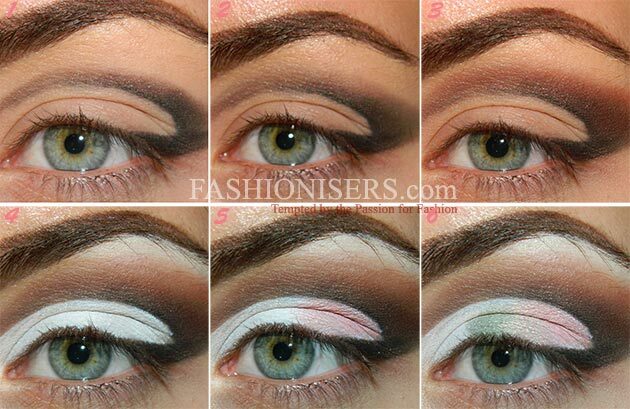 Step 2: Contour your eyebrows, using the correct tone for your eyebrows. Keep in mind that playing black here is a huge mistake! Step 3: Draw a fake crease with a black waterproof pencil. Cover the black line you have drawn with a black eyeshadow. Blend the black eyeshadow. Apply a matte brown eyeshadow above the black line. Blend this well. Step 4: Apply a white watercolor eyeshadow under the fake crease all over the lid (Make-Up Atelier Paris Watercolor in White). Apply a pinky peach eyeshadow to the outer edge of the eye over the white color, reaching the fake crease (Scout from the Anastasia Beverly Hills Catwalk Palette). Next to the pink eyeshadow, to the center of your lid, apply a light green eyeshadow over the white one (Moss from the Anastasia Beverly Hills Lavish Palette). Now, apply the same pinky peach shade you used on the outer edge of your eye to the inner corner of the lid. Step 5: Apply a matte dark brown eyeshadow under your eye (Beauty Mark from the Anastasia Beverly Hills Catwalk Palette). Step 6: Apply a white pencil to your waterline (NYX Jumbo Pencil). Apply black eyeliner. Step 7: Highlight your eyelashes with black mascara and use false lashes for the most striking festive look. Step 8: Emphasize your pout with an orange/red lipstick. What else do you need to look mesmerizing this festive season? Oh yes, a glam dress and a chic hairstyle! And yes, let the party started!